The Safari 580HF snorkel is tough, stylish and has been designed to deliver a huge volume of the coolest and cleanest air possible into the stock air cleaner assembly of the TD4 & TD5 Land Rover Defender. The genuine Safari Snorkel body and air ram is manufactured to the highest standards in durable, UV stable, cross linked polyethylene material.<br> <br> In addition, the substantial material wall thickness delivers huge physical strength to ensure that the snorkel breezes through the toughest off-road conditions on the planet. The Safari Snorkel system is supplied as a complete and comprehensive system that includes every nut, bolt and bracket required for installation - right from robust zero-corrosion stainless steel studs, stainless steel self-locking nyloc nuts and large diameter stainless steel body washers through to the tough plastic A-pillar inserts. The Safari 580HF snorkel is tough, stylish and has been designed to deliver a huge volume of the coolest and cleanest air possible into the stock air cleaner assembly of the TD4 & TD5 Land Rover Defender. The genuine Safari Snorkel body and air ram is manufactured to the highest standards in durable, UV stable, cross linked polyethylene material. In addition, the substantial material wall thickness delivers huge physical strength to ensure that the snorkel breezes through the toughest off-road conditions on the planet. 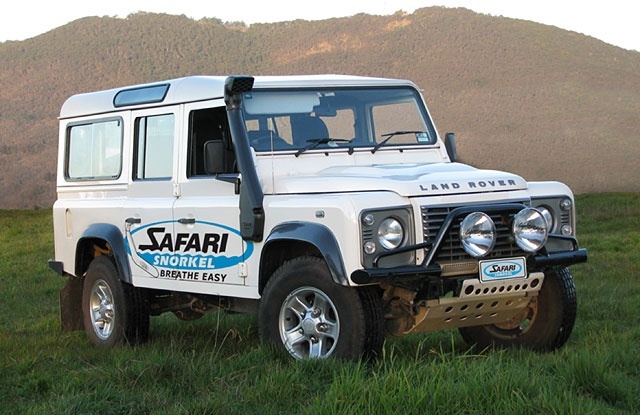 The Safari Snorkel system is supplied as a complete and comprehensive system that includes every nut, bolt and bracket required for installation - right from robust zero-corrosion stainless steel studs, stainless steel self-locking nyloc nuts and large diameter stainless steel body washers through to the tough plastic A-pillar inserts.